They have perennial friends, including the most beautiful single peonies I've ever seen. 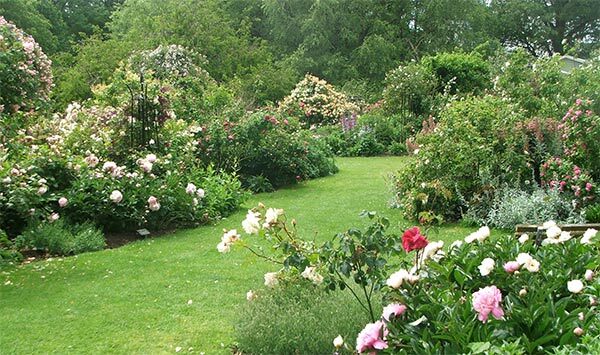 All the rose borders are lovingly surrounded by gently swirling grass paths. There are strategically placed garden benches for human relaxing, and structures (posts and pyramids) for rose climbing. Not so many visitors, though - I was alone on the warm, sunny day of my visit. 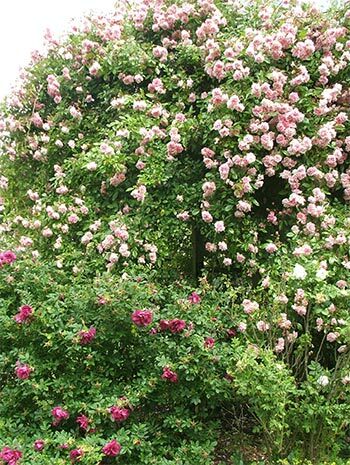 These old fashioned roses are a well kept garden secret! The collection in the Christchurch Botanic Gardens doesn't demand to be colour co-ordinated, either. Big velvet reds show off next to apricots and pinks, while creams and icy lemon whites make perfect neighbours. Flowering Once - Not a Problem! 'They only flower once' says my friend, patiently shuffling along in slow motion while I click my camera. But they are shrubs, after all - and better to flower magnificently once than to struggle for months and produce a scattering of flower colour. 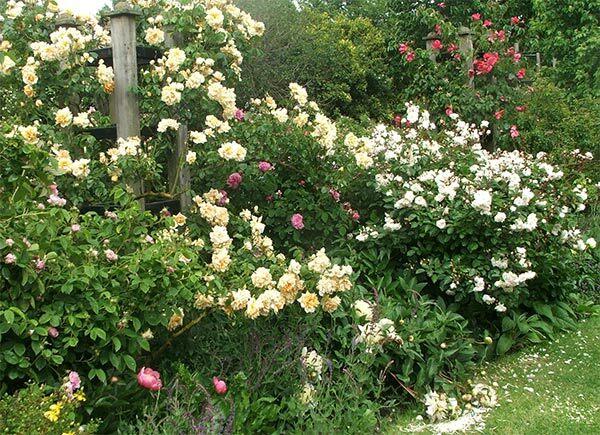 We gardeners can definitely get rose-greedy! Members of my own small collection of old-fashioned roses are scattered throughout the Moosey Garden. Many came here by accident, or from cuttings, and in my early gardening days I was less than welcoming to the once-flowering types. The ramblers in particular have been rather bold. My yellow Banksia rose is slowly smothering the clothes line and bringing the fence posts down with it. A creamy rambler has discovered it can reach the roof of the woodshed, while the pink rambler grown over this roof is off to bigger brighter places - been there, done that. 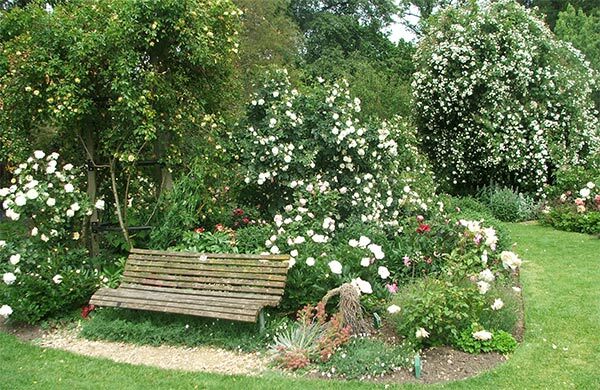 This is a rose garden where every view, from every vantage point, in every direction, is breathtaking. I've randomly pointed the camera, knowing that every single picture has the potential to be automatically stunning and beautiful. I hope I've been successful! 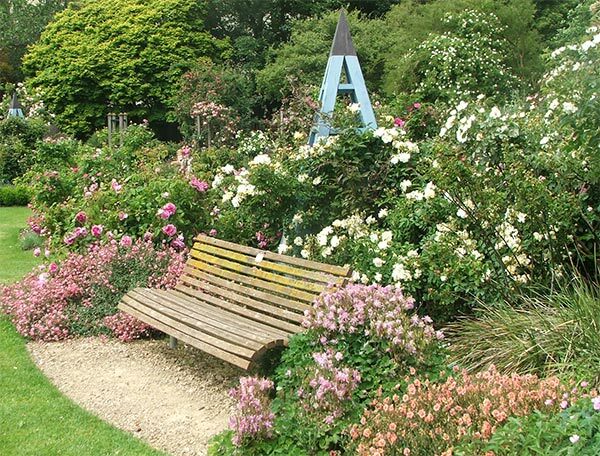 For a number of sweet weeks in November, the Old-Fashioned Rose Garden in the Christchurch Botanic Gardens is the most beautiful place to visit.